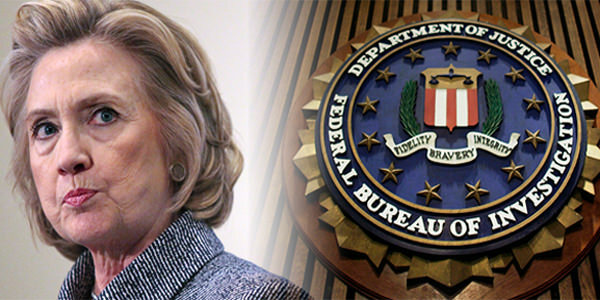 FBI Insider Blows the Lid off Hillary’s Investigation! Earlier today, Hillary was caught off camera, screaming at her staff after her Matt Laurer NBC interview: “If that f ………. b………..gets elected we shall all hang from nooses”. The following which was forwarded from an FBI source, and is currently being reported throughout social media, explains Mrs. Clinton’s desperation. The following is from an FBI insider. You can be among the first to read and understand what is truly at stake! A) Turn over all of the information to the Department of Justice, make public a recommendation, the truth comes out, the entire world realizes how much the U.S. is meddling in foreign affairs and we go to war, the civilian population realizes how much foreign money influences our government, and a civil war begins. B) Cherry-pick the data to implicate the people already in the eye of public opinion, so the chips fall on the heads of a select few and the whole system does not crash. C) Do nothing and watch the unstable political climate to gauge how you will respond. I am confident if Trump wins Hillary will be going to jail and that is what THEY won’t allow that to happen at any cost!! The problem is the entire Government!!!!!! Hillary sold safe access programs to overseas “donors.” All I can tell you about the Safe Access Programs is Hillary had them, and she did not have proper authority to have any of them. They were leaked to her by someone, and she did sell them to overseas donors. Possessing them alone makes her guilty of treason. Obama is loosely tied to the Clinton Foundation, but much more tied in with the same people who donate to the Clinton Foundation. Russian borders, Ukraine, everywhere NATO is, the South China Sea, the Philippines, Taiwan, Hong Kong, and Africa. George Soros is at the heart of all of this. If it comes down to it, I would fight. But most of us are of the opinion that Hillary will not be president, and having Trump in office makes our job that much easier. But right now we have to carefully wade through the mud. As I stated before, Bill Clinton likely wanted Loretta Lynch to focus on the e-mail server and shy away from prosecuting the foundation. Needless to say if anyone has any doubts about the validity of the above info, it stands to reason that the originator has to conceal his identity. Anyone present at the FBI hearings was sworn to secrecy and leaking any info would at least cost him his job and most likely add some jail time to boot. Worst case scenario, someone probably would “put a contract out” on him. Most of us know, at least the ones who have paid any attention to politics know that in the past, many who have crossed the Clintons, met an un-explainable early demise…Ron Brown and Vince Foster were no exceptions.